"Dear God, O.K. I kept my half of the deal. Where's the bike?" The Sinas Dramis Law Firm is deeply committed to the safety and rights of cyclists and is a proud member of Bike Law, a national network of bicycle attorneys who advocate on behalf of all cyclists. Bryan Waldman, the lead attorney of our firm’s bicycle litigation group is a competitive bicycle racer and frequently lectures about the laws that apply to cyclists. The law firm co-sponsors two events each year that give bicycle helmets to kids and ensures they are fitted properly. To date, these events have fitted over 5,500 children with bicycle helmets. The firm is also a title sponsor of the CFT-Sinas Dramis Law Cycling Team. Copies of the new addition are now available to download here on our website. 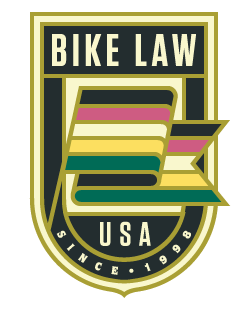 If you would like copies for your bike shop or other bicycle friendly business, email bryan@bikelaw.com. The Sinas Dramis Law Firm publishes a booklet entitled “A Legal Handbook for Michigan Cyclists” written by one of the firm’s partners, Bryan Waldman. The booklet summarizes and explains laws that commonly apply to cyclists. Copies of the booklet can be requested by calling 517-394-7500. Pocket size versions, which contain an abbreviated format of the publication and fit in a bicycle seat bag or pocket are also available. What Happens When a Person is Injured in a Bicycle/Automobile Accident? What Happens When a Bike is Damaged in an Automobile/Bicycle Accident?